Scottish Gourmet USA sells the best Scottish foods available in the USA. 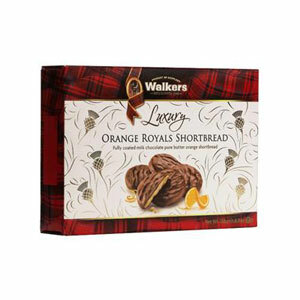 Enjoy this delightful combination of orange shortbread and creamy milk chocolate. From Walkers, of course! From Walkers of Aberlour, famous for their shortbread, comes another indulgence that is sure to please! Real pieces of crystallized orange peel are baked inside each buttery shortbread round, and then creamy milk chocolate coats each cookie. The result is addictive - is it candy? Is it a cookie? No, really much more than that. Store in a cool dry place. 5.3 ounce box holds 12 special cookies. Ingredients: milk chocolate 52% (sugar, full cream milk powder, cocoa butter, cocoa mass, emulsifier, soya lecithin, natural vanilla flavoring), wheat flour, butter (14%), sugar, crystallized orange peel(4%)( orange peel, glucose fructose syrup, sugar, citric acid), natural orange oil , salt. The Walkers story begins over a hundred years ago in 1898, when the twenty-one year old Joseph Walker opened the doors of his own bakery with a loan of £50 and the dream of making the finest shortbread in the world. By 1975, Walkers had outgrown their extended bakery, and moved to a custom built factory that gave them the extra space and facilities they needed to develop new products such as Chocolate Chip Shortbread and speciality biscuits. Still family owned and operated, today the third generation of the Walker family are using the same traditional recipe developed over 100 years ago, and is the largest shortbread company in the world. This is a non-perishable food item.This food item is eligible for lightweight shipping by Priority Mail. If you are ordering non-perishable food products and non-food products to ship to the 48 continental United States, you pay a flat rate of $15 for ground shipping. Delivery will be from 5 to 10 days from the time you place your order. Delivery will be by UPS Ground Delivery or USPS Priority Mail depending on the weight and ship to location. Lightweight orders under 1 lb will be charged $8.50 for shipping. Lightweight orders from 1 lb to 3.5 lbs will be charged $10 for Priority Mail shipping. All orders are shipped from our North Carolina warehouse. Shipments to Alaska & Hawaii are sent by Priority Mail in flat rate boxes and will be charged at the actual USPS rate for smallest possible box or boxes for your order. Love It! Have ordered it a few times. Tasted great but chocolate completely melted when delivered. © Copyright 2019 Scottish Gourmet USA. All Rights Reserved.